The 5 Star SC16 is a strip-cut model which shreds into strips 6mm wide. It has a P-2 security rating which means it’s suitable for everyday shredding (rather than the shredding of confidential material). 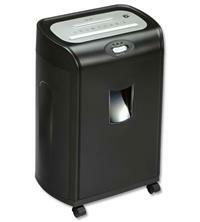 The paper entry width is 225mm and this shredder can also shred credit cards, paper clips and staples. Up to 16 sheets of paper can be fed into the unit at a time and there is a 19 litre capacity bin. Other features include auto start and stop, a reverse function which can help to clear paper jams and overheat protection, meaning the shredder will stop if it becomes too hot and require a cooling down period. The SC16 also has a handy feature whereby the shredder won’t function until the door is closed securely.